This addendum shows you how to adapt our standard setup in order to produce larger volumes of finished product. This mostly involves changes to our standard 30A control panel build instructions to build a higher power 50A control panel, capable of providing more power per kettle. 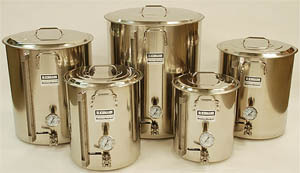 Perfect for 1-3 bbl (31-93 gallon) electric brewing systems or for reducing heat times on any setup. When would I want a 50A control panel for 30+ gallons? 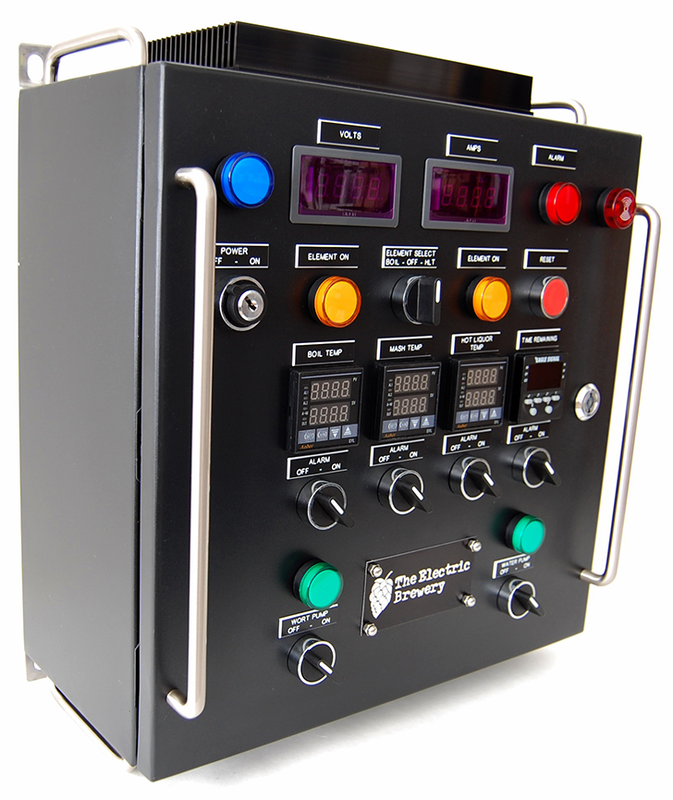 Our standard 30A control panel is adequate for brewers looking to produce up to around 20 gallons of finished product. A single 5500W element is used in both the boil kettle and hot liquor tank. To produce 30 gallons or more, some brewers prefer to have more power for faster heating (ramp) times and to ensure a vigorous boil regardless of ambient temperature. With the 50A control panel for 30+ gallons the single 5500W elements are replaced with two 4500-5500W elements for a total of 9000-11000W per kettle. 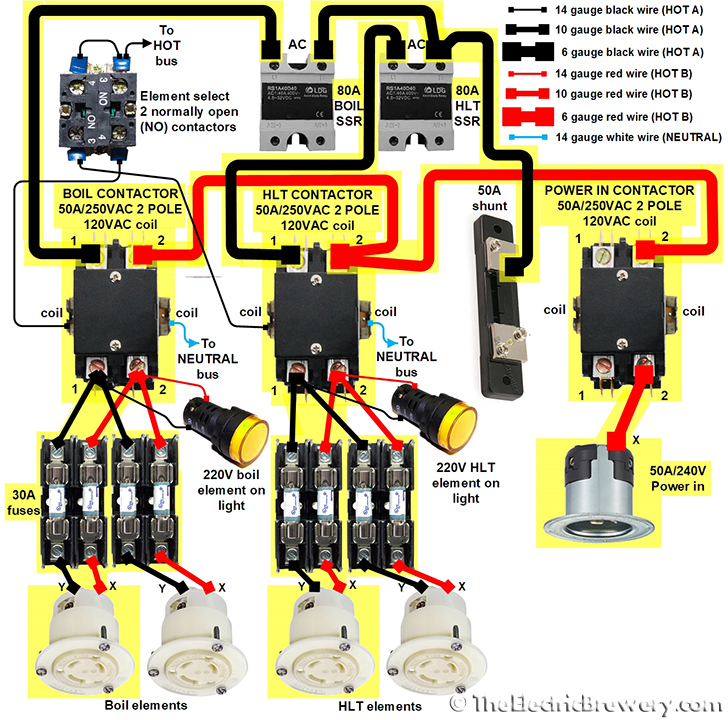 Consider this control panel for if you're interested in producing more than 20 gallons of finished product and wish to speed up your brew day by reducing heat times. If you're consistently producing 30 gallons or more then we highly recommend this control panel be used. Only brewing smaller (5-20 gallon) batches now but may want to go bigger in the future? Consider this 50A control panel for 30+ gallons. It will let you use one element per kettle now, and and add a second in the future for more power. If you're looking for the fastest heating/ramp times possible on even smaller batches, consider using this control panel and adding two heating elements in the hot liquor tank. Are there any downsides to using this control panel? Cost is the only downside. 50A components and wiring are more expensive than similar 30A rated items. 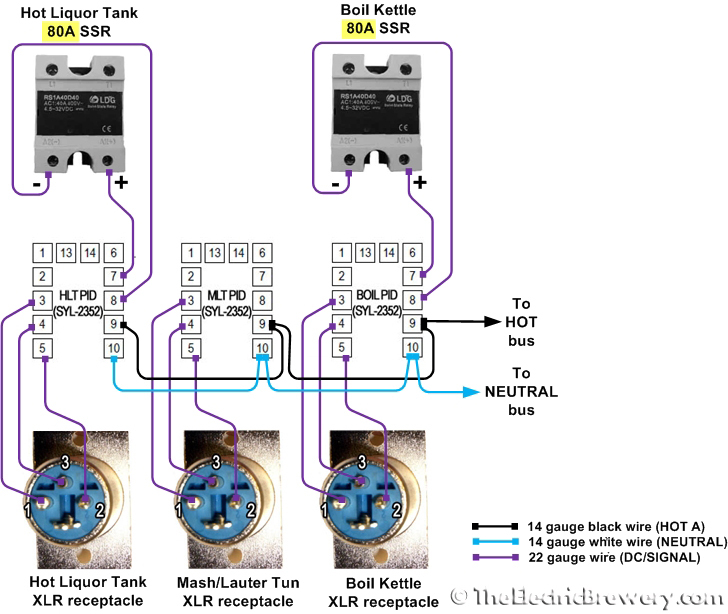 Unless you want to consistently brew over 20 gallons at once or wish to upgrade in the future, we recommend sticking with the original 30 amp control panel design. Many brewers producing 20 gallons per batch are happily using 5500W per kettle with the standard 30A control panel. 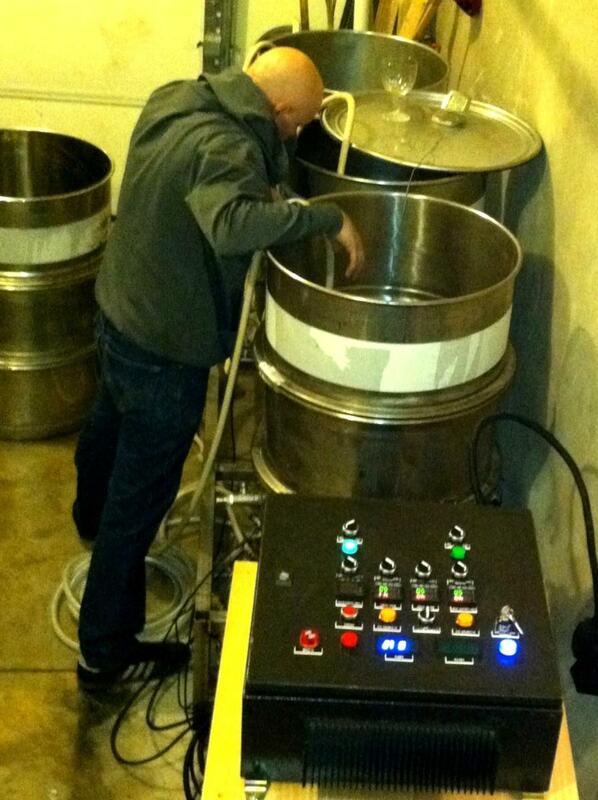 Some 1 bbl (31 gallon) brewers are also successfully using the standard 30A control panel. Others who only occasionally want to brew larger batches will brew two separate batches and combine them. Yes. More power simply means faster heating. Some brewers will use a 50A control panel to be future proof. It gives them the capability to add more power with a larger future setup without having to replace or modify the control panel. 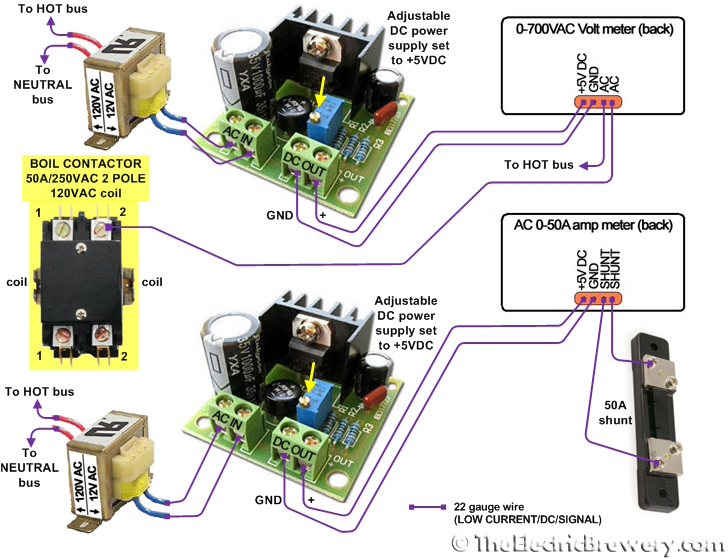 If one of the heating elements will not be submersed when brewing smaller batches, that heating element should be unplugged from the control panel. The control panel will still operate normally. Can I unplug one of the heating elements when making smaller batches? How much faster does 9000-11000W heat compared to 5500W? A 5500W heating element such as the one we use with our standard 30A control panel will raise the temperature of 1 gallon of water by 1 degree Fahrenheit in approximately 1.6 seconds. 9000W reduces this time to 1.0 seconds. 11000W reduces this time to 0.8 seconds. What changes are needed to upgrade from 30A to 50A? All of the 30A devices (and wiring) in the control panel are upgraded to 50A and we add one extra element to both the Boil Kettle and hot liquor tank. The 30A standard dryer outlet is replaced with a 50A stove outlet. See below for complete details on the changes required. Are instructions available for countries that run only at 220-240V? No, not at this time. These instructions are for use in North America or other countries where both 120V and 240V are available. To adapt for 220-240V only countries these instructions would have to be merged with our FAQ: Control Panel changes for 220-240V countries article. At this time that exercise is left up to the reader. Two extra element receptacles are required on the bottom of the enclosure. There is room on the standard 16x16x8" enclosure we use if you're careful about placement (see below for pictures). Consider using a larger 20x20x8" enclosure for more room to work in. Keep in mind that the control layout may have the be re-thought if a larger enclosure is used and the handles may not be long enough. 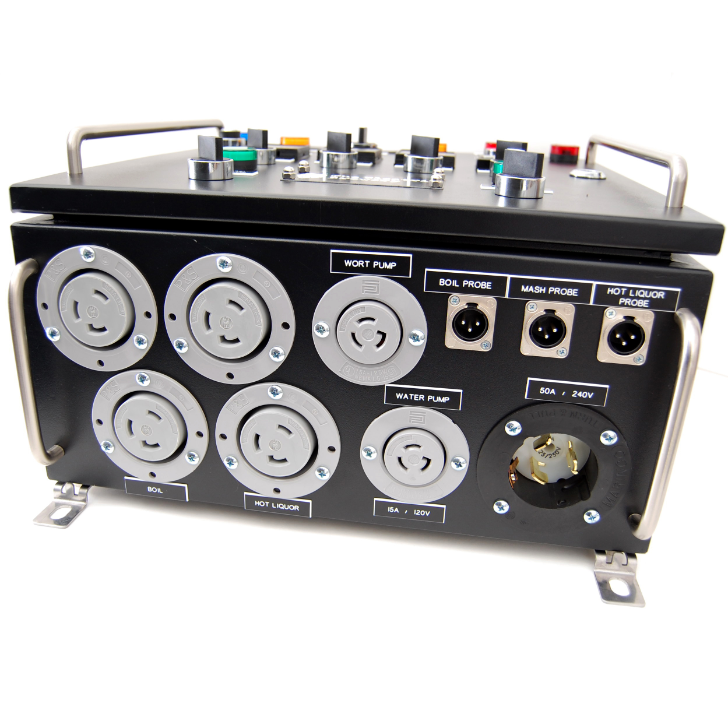 Our pre-built control panels and kits all use the same 16x16x8" enclosure. On the inside most of the 30A wiring and components have been upgraded to 50A and extra fuses are added to protect the 30A heating element wiring. 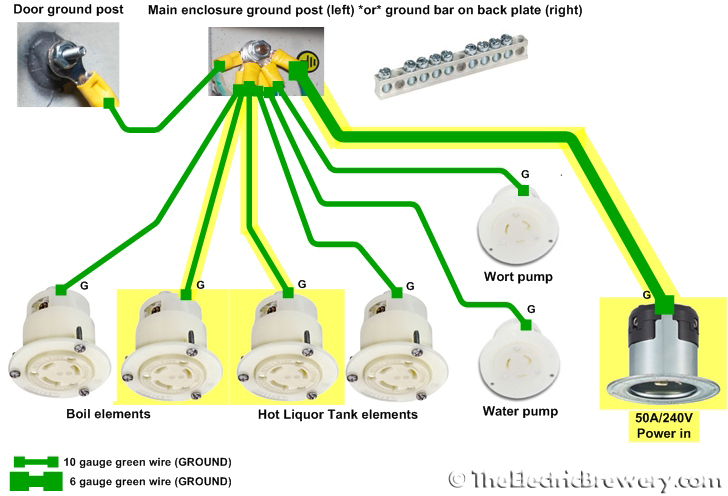 The wiring diagrams below replace the standard 30A control panel wiring diagrams, where changes are required. It is important that you still read the instructions for our standard 30A control panel build to make sure nothing important is missed. Often hints, tips or caveats are given. Do not build only using the diagrams below. You will most likely miss things. Two extra ground wires are required for the two new element receptacles. The ground wire from the power input receptacle is increased from 10 to 6 gauge. There may not be enough room on the enclosure ground post for all these ground wires so you may want to use a 10 terminal 50A ground bar on the back plate instead. Make sure to connect the door and enclosure ground posts to the ground bar as well. 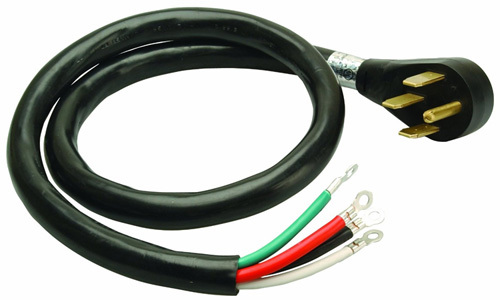 Any ring terminals or connectors (if used) for connecting the 6 ga wire must also be rated for at least 50 amps. 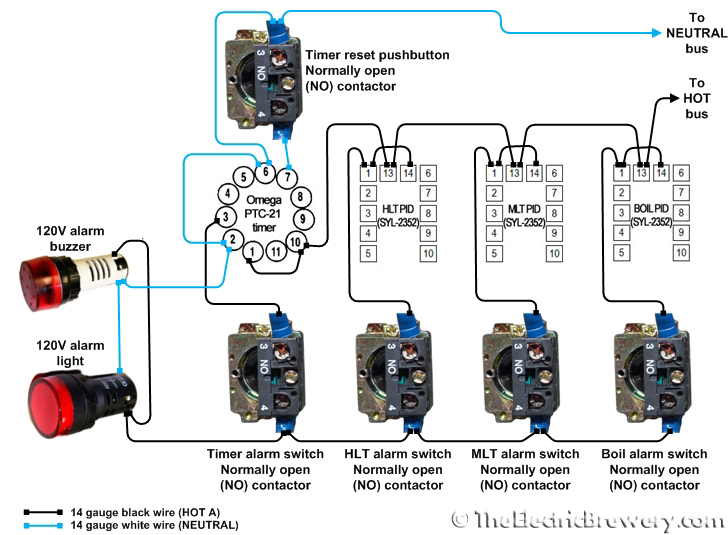 The boil relay is changed to a contactor to handle the larger 50A (resistive) load. 50A relays are difficult to find so a contactor is used instead. The SSRs are upgrade from 40A to 80A to handle the increased load. 9000W at 240V pulls 37.5 amps so technically the 40A SSR used in our standard 30A control panel may be used. It makes sense however to move up to the next step (80A) as the cost difference is minimal and provides some headroom. The custom heatsink we designed is more than large enough. 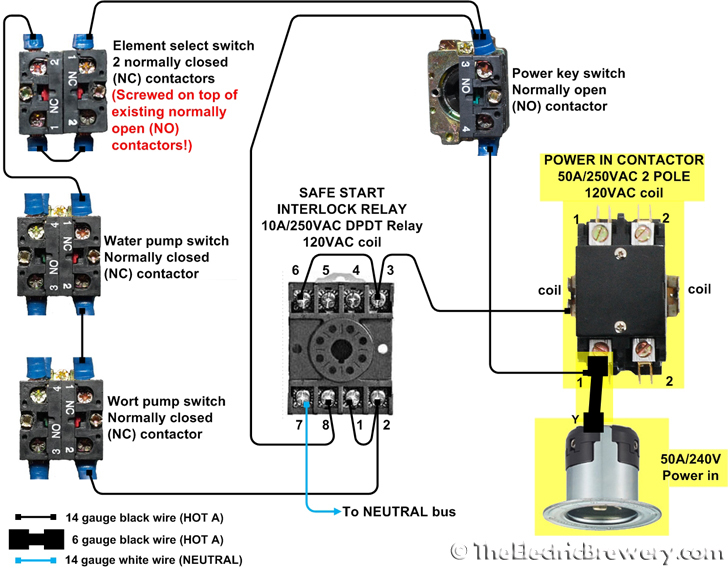 The last 30A relay is changed to a 50A (resistive) contactor. Two extra element receptacles are added and wired in parallel (not series) to the existing elements. Some of the 10 gauge wire is replaced with 6 gauge to handle the 50A load. 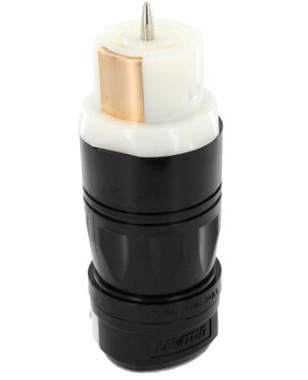 30A fuses are added to protect the 30A element receptacles and wiring. Why? On the standard 30A control panel the 30A circuit breaker in the electrical panel wall protects the 10 ga wiring so additional fuses are not required. With this 50A panel the 50A circuit breaker in the electrical panel protects the 6ga wiring but we now need to add protection for the smaller 10ga wiring between the contactors and the kettles (both inside the panel and out). 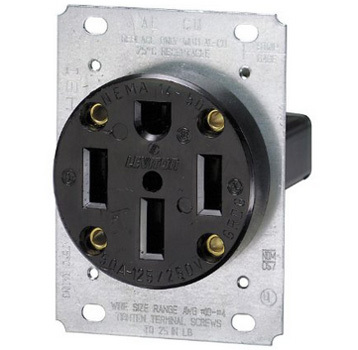 Any ring terminals or connectors (if used) for connecting the 6 ga wire must also be rated for at least 50 amps. Note: With some contactor brands you may find it difficult to fit the two large 6 gauge red wires in the same screw hole at the top input #2 on the HLT contactor. Do not under any circumstances trim back strands of the wire to make them fit! Instead, use a power distribution block. 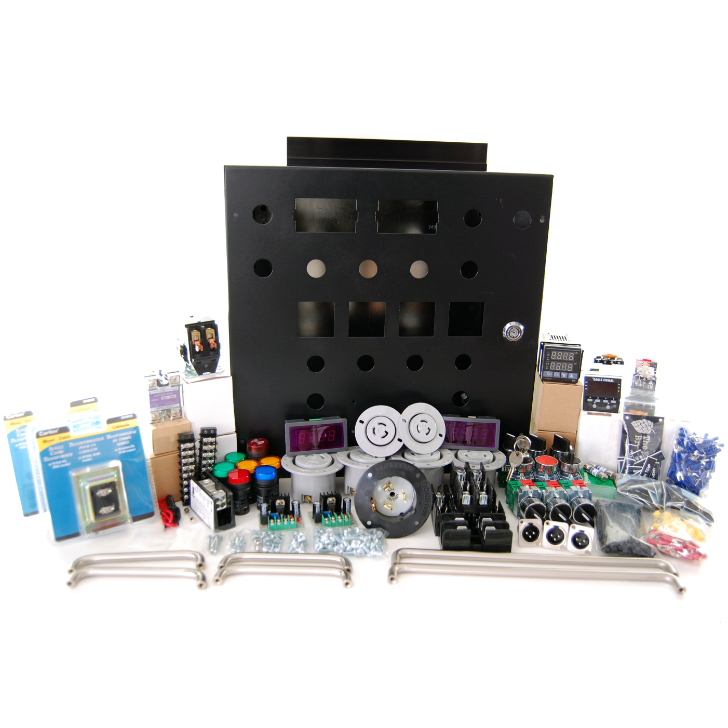 Our control panel kits include this extra part (when required). 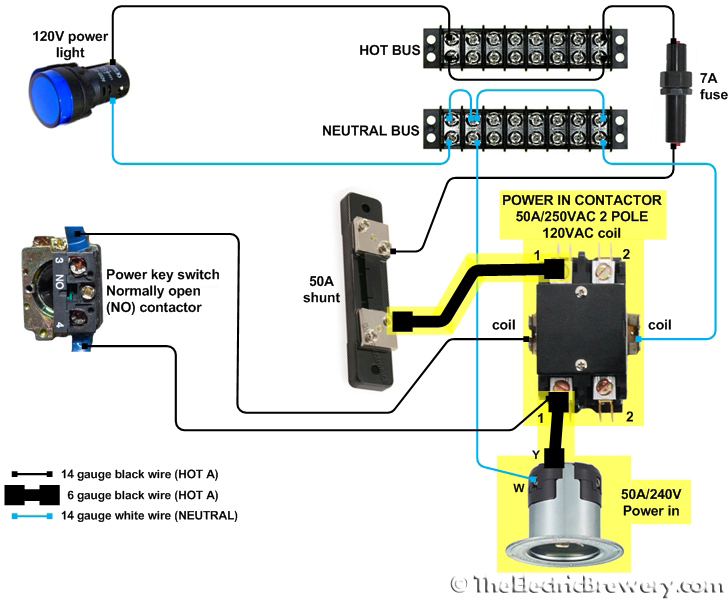 Simply attach the large 6 ga wire from the POWER IN CONTACTOR into the big end of distribution block and then two 6 ga wires out the other end that lead to the BOIL and HLT contactors. The power in receptacle and relay were changed to handle the larger 50A load as described previously. No further changes are required. Previously the ELEMENT SELECT switch contained two normally open (NO) contactor that were wired up (per the HEATING ELEMENTS wiring diagram above). We are now adding two normally closed (NC) contactors on top of the existing contactors. Only the new wiring is shown here. The existing wiring does not change. 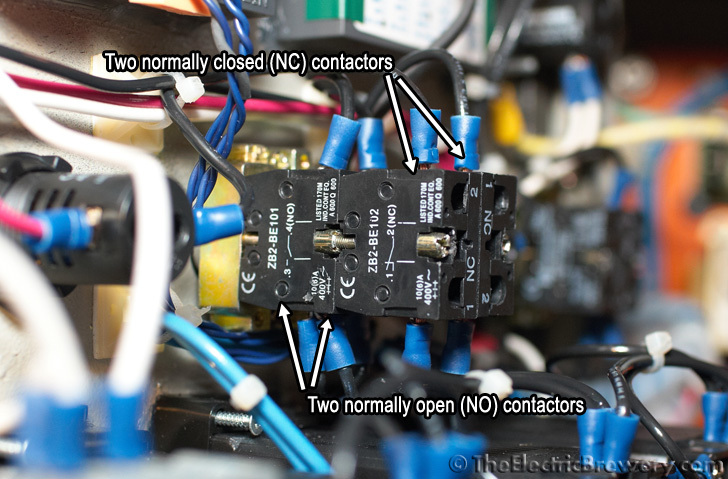 As per the standard safe start interlock instructions for the 30A panel, the two normally closed (NC) contactors that are added to the Element Select switch are screwed on top of the existing normally open (NO) contactors as shown in the picture below. Use two of the unused NC contactors from any of the other switches (other than the pump switches of course). Nothing else in the control panel changes since the rest is all low current 120V. All the switches and how the panel operates remains identical. You just now have twice as much power in each kettle. They’re likely a better match for a setup that uses twice the power. The inlet is a full 1” which like the pumps I use (3/4” inlet) helps reduce cavitation/priming problems. This larger inlet is important. You’ll get about twice the flow rate (17 gpm max) as compared to the March pumps I use (7 gpm max) which can help with ramp times too when doing step mashes. Stainless - 1" MPT x 1/2" FPT Bushing. This must be done for both pumps. No other changes are required. If you choose to run the pump(s) through the control panel make sure that you stay under the max power draw requirements as outlined in the control panel specifications on the order page when combined with the heating elements you plan on using. That said, this is all theoretical. I've never used these pumps myself but some using our design have been very happy with them. I think that the same March pumps I recommend in my instructions would probably still work well on a 1bbl+ setup and many brewers use them, but after a certain point (2 bbl? 3 bbl?) you may want the higher flow rate / reduced time. Anyone looking at a serious 1 bbl setup needs to stay away from the polysulfone (plastic) heads. They're brittle. That much is sure. Note that both pumps are notoriously out of stock constantly so if you see them available jump on them. I had to wait 3-4 months for mine after placing my order! While it may be obvious to most, to brew a full barrel (31 gallons) you are going to need three Blichmann 55 gallon kettles instead of the 20 gallon ones shown in my pictures. Extensions are also available to extend your 55 gallon kettles to 100 gallons. To remain 100% flexible, you typically want the kettles to be twice the size of the finished beer you want to produce. Some may find this overkill, for example, the MLT could be smaller if you only ever brew average gravity beers. But one day you may decide that 12% barley wines are all you want to drink. Link Posted: Wed May 04, 2011 1:41 pm Post subject: Kai - will you sell the modified panels? We'd prefer to sell the modified panels as kits, at least at the time being. 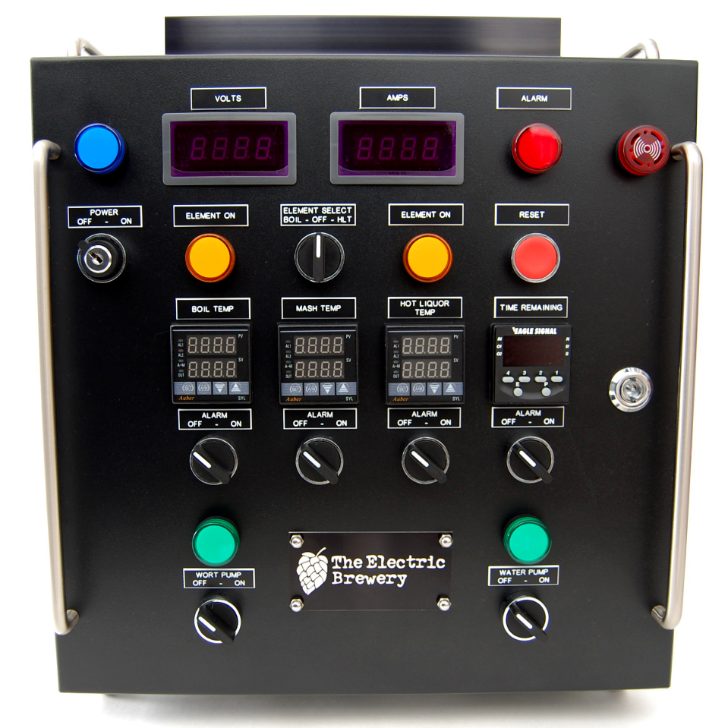 (EDIT: Both kits and pre-built 50A control panels are now available). No reason why the control panel wouldn't work with any kettle as it's simply the source of control/power. Thank you for your reply. Please let me know when you will offer the modified panel kit and if there is a special way to purchase it. Hi Kal. Thanks for the great website. It can get overwhelming sifting through all the information out there about homebrewing but you've done a great job putting everything into a clear and focused set of plans. 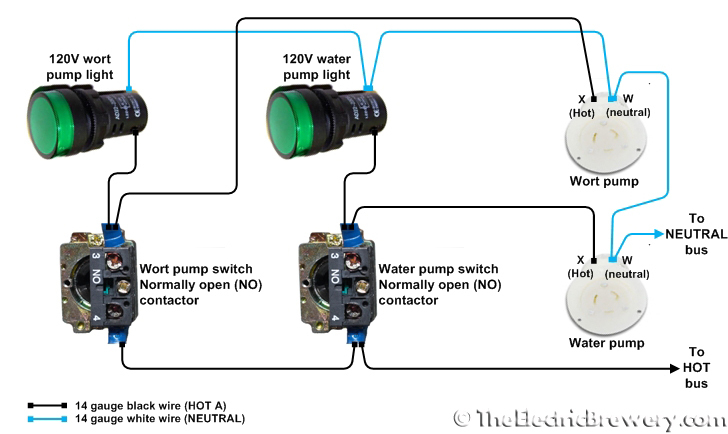 So my question is would someone be able to use a 60 amp receptacle, connector and cord instead of the 50 amp you have spec'd? Wouldn't that give you enough power to run 2 5500 watt heaters? Theres probably an obvious answer but I know very little about electricity. We're going to be sending out some 50A kits soon to people. If you're interested, email us at Sales@TheElectricBrewery.com. Yes you can use a 60A plug and receptacle for the power input on the control panel. The problem is that there's no standard 60A plug/receptacle that exists really - they're very hard to find and non-standard. The other issue is that assming you do make up a power cord for it, where do you plug it in for power? There's no standard outlet you can use like the dryer outlet in our 30A setup or stove outlet in our 50A setup. You need hardwire it into your house's electrical panel most likely. So yes, it can be done but we can't really show someone how to do this. Thanks for the quick response. I guess that explains why I was having such a hard time finding 60 amp parts. They don't really exist. On a side note, I just got my control panel enclosure today and it is massive. I wanted to make sure I'd have enough room so the one i got is 20x20x8". Maybe if I'm lucky I'll have enough space left over to add a small TV. What would be better than watching baseball and making beer? Maybe watching baseball and drinking beer. But what would be better than drinking beer while making beer and watching baseball? 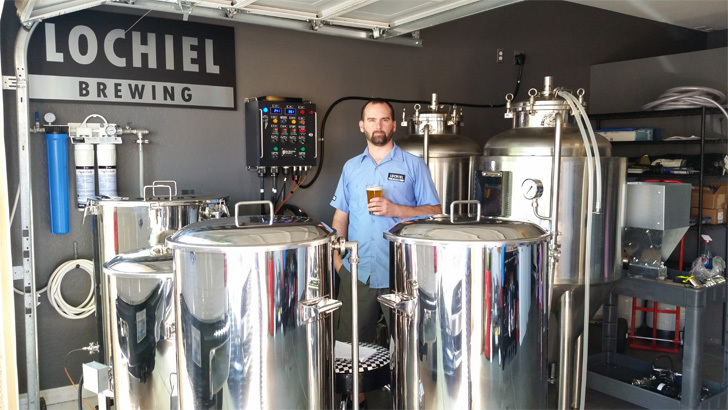 How about drinking beer while making beer while watching hockey? (Sorry, I'm from Canada). Only the low powered items use the buses so they're fine. The high powered elements use direct wiring. This is why the buses weren't listed on items that need to be upgraded. Maybe Mike could add a 7 in lcd into a 50 amp custom panel with a coax and hdmi hookup so you could watch right on the panel. Would you happen to have any additional pics or dimensions on your stand? I'm looking at doing a similar set-up with barrels, so any advice you have would be helpful. Yeah I have a cad drawing of it at work. Ill post it on Monday. The actual stand is a little different than the drawing because I had a friend weld it and he decided to follow a drunken napkin sketch instead of the pdf. Oh well. It works so as long as the welds dont break I cant be too mad. Itll cost you about twice as much to do stainless but I think its definitely worth it. I kinda slide the barrels off the stand to clean them because theyre heavy. I think they'd scratch off any paint pretty quickly. Theres a guy on homebrewtalk.com that makes custom stands for one barrel systems too. I cant say anything about them from personal experience but they looked decent and the price seemed good too. It looks like only one picture uploaded. Ill see if I can post some more of them later too. 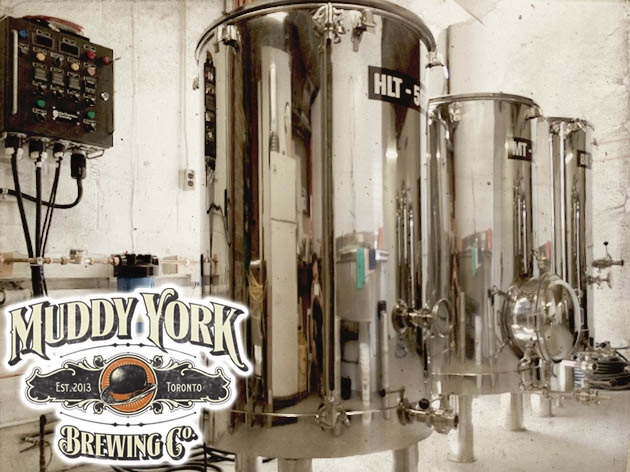 When adding the stainless coil to the HLT, should you increase the standard 50' length to say, 100' to account for the increased volume in the mash or should the 50' of tubing be enough surface area for proper heat transfer? I just want to make sure that when mashing out that we will have sufficient surface area in the HLT to raise the temp of the wort in a decent amount of time.